The 2017 Dragon horoscope predicts that this year is bound to seem a little crazy at times. Twists and turns will come your way all year. Don’t run away from your troubles though! The change will help you to build character. The Chinese horoscope 2017 Dragon forecasts ask you to use this year as a sort of learning experience. Use your emotions to help you with social interactions. Use your new friends to your benefit, but don’t just “use” them. Watch yourself, but don’t be afraid to have fun either. Follow your instincts in this year of the rooster and you are sure to have a good Chinese 2017 new year. The Dragon 2017 predictions suggest that you will be more talkative this year. This will make it a lot easier for you to make friends than it might have been in previous years. This year you might also feel more inclined to share your feelings with others. This may make you seem more sensitive than others. How you act on that will define how your social life will go in this year of the red fire rooster. The 2017 Chinese horoscope predictions for Dragon also show that this year you will be able to talk out better any problems that you might be having with your partner. There are likely to be many changes this year like pregnancy or birth of a child. So it is best to be as adaptable as possible both sexually as well as emotionally. The Dragon zodiac 2017 forecasts also foretell that you are also likely to meet up with old friends or romantic partners this year. You might even be able to repair any lost bonds that there might be between the two of you. In short, your social life does not follow any certain path this Chinese lunar new year 2017. There are many possible outcomes for it, and they all depend on your actions and feelings. The Dragon 2017 horoscope predicts that this year your workload on your job will be heavier than usual. It will be hard to do it alone, so don’t. Make friends with your coworkers or bosses so that you can get outside input and help on your projects. For most of 2017, you are likely to need help on projects, but at the early beginning of the Chinese new year and near the end you should be able to manage on your own. The 2017 Chinese astrology predictions ask the dragons not to lose sight of their goals. Although you need to work with others it doesn’t mean that you should become dependent on them. There is some good news here when it comes to the dragon’s profession. Since you will be working with others it is more likely that you will get more work done in 2017. The Year of the Rooster 2017 predictions for the dragon foretell that it is likely that you will make more money this year because of your people skills. Make sure that you spend your money well. Pay off any debts that you might have before you spend your money on frivolous things. If you do have money left over, don’t be afraid to get yourself a small gift, but remember not to splurge. The 2017 Dragon horoscope also forecasts that you are also likely to be more relaxed this year. Less stress will come your way. Make sure that you take care of your responsibilities as soon as possible so that you have more time to relax. Your energy levels will have their ups and downs this year. So make sure to exercise when you feel full of energy. Make sure to watch your diet. Pace yourself this year in all matters of your life. Here are some foods that will boost your metabolism. 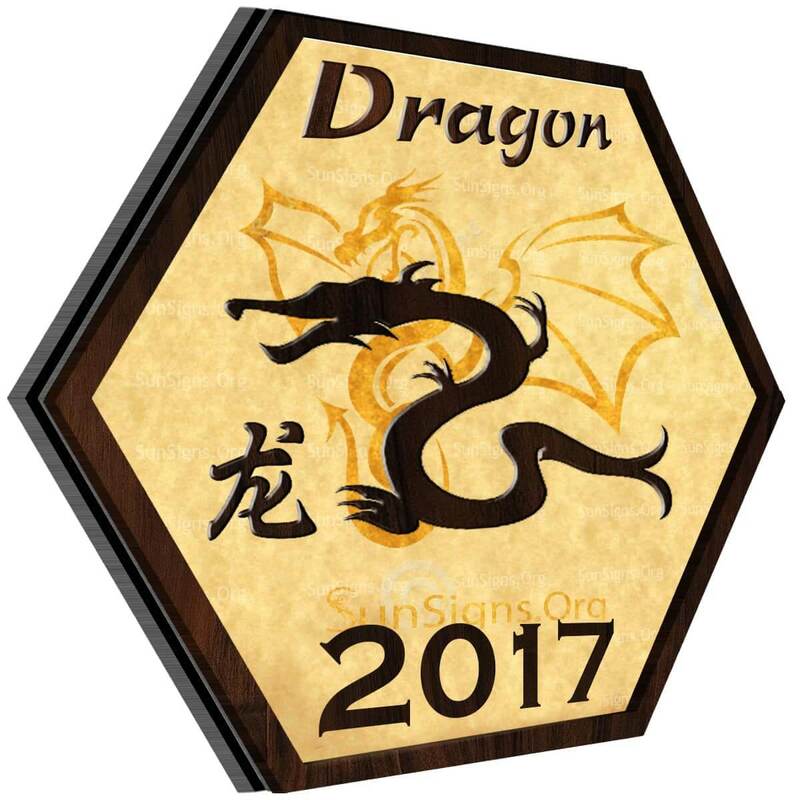 The Feng Shui yearly predictions 2017 for the Dragon are favorable. You will fare well in both your personal as well as professional life. To conclude the Dragon horoscope 2017 predicts that this year you are more likely to be confident. You are more likely to speak your mind in situations where you usually wouldn’t. This can help you to better express yourself, which can attract friends and partners who may have similar interests. However, speaking your mind in the wrong places or around the wrong people can get you in trouble. Remember, sometimes censoring yourself is important in 2017. There is a mistype on the year of the Dragon. It is suppose to be 1964 not 1954.